Site plan for the northern portion of Merriweather Park at Symphony Woods, with major park features labelled. (Click for a higher-resolution version.) Image © 2014 Inner Arbor Trust; used with permission. tl;dr: Now that construction of the Chrysalis is complete, what are the next steps to fulfill the vision of Merriweather Park at Symphony Woods? The previous few articles in this series discussed the design and construction of the Chrysalis itself. Now that construction of the Chrysalis is complete I take a look at what’s next for Merriweather Park at Symphony Woods. In particular, this article focuses on other Merriweather Park features that are already part of the Site Development Plan approved by the Howard County Planning Board and are thus candidates for the next few years of park development. Areas addressed in each phase (1 through 7) of the development of Merriweather Park at Symphony Woods. (Click for a higher-resolution version.) Image adapted from sheet 2 of SDP-14-073. 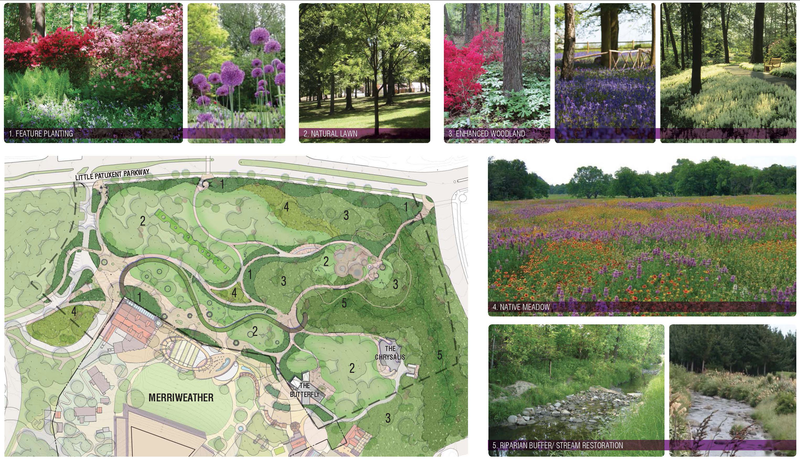 When the Inner Arbor Trust went before the Howard County Planning Board in November 2014, it sought approval not just for the Chrysalis amphitheater, but for a whole range of planned features for Merriweather Park at Symphony Woods—or at least the northern portion of it. (Recall that the Symphony Woods property also includes areas to the east, south, and west of Merriweather Post Pavilion.) In their combination of beauty and utility these features make Merriweather Park a more attractive destination for visitors and provide various key functions needed to accomodate them. SDP-14-073, the Site Development Plan for Merriweather Park at Symphony Woods, outlines 7 phases of park development, with phase 1 being the construction of the Chrysalis and related infrastructure and phase 2 construction of an additional path connecting to the Chrysalis. In approving SDP-14-073 the Planning Board approved the design concepts, uses, and locations of park features for all 7 phases, and fully approved phases 1 and 2 for construction. The Chrysalis and related infrastructure, including an access road to the rear of the stage, a parking lot with 7 handicap spaces, and an accessible path from that parking lot to the Chrysalis. A new park entrance at the corner of Little Patuxent Parkway and South Entrance Road, leading to the Chrysalis via an accessible boardwalk. This phase also includes the Sky Horns, a sound sculpture near the entrance (part of the Merriweather Horns public art) and restoration of the two streams on the eastern side of Merriweather Park. The Butterfly guest services building and related infrastructure, including a rooftop terrace with lines of sight into both the Chrysalis and Merriweather Post Pavilion, and a large three-tiered deck facing the Chrysalis. The Merriground play area and another new park entrance, from Little Patuxent Parkway across from the Mall in Columbia access road (to the west of the first park entrance). This phase also includes the Song Cycles, a second sound sculpture near the new entrance. The Picnic Table and associated paths, including a third entrance to the park from Little Patuxent Parkway (to the west of the first two park entrances). This phase also includes the Land Horns, a third sound sculpture near the new entrance. The Caterpillar and associated paths. A renovated access road from Little Patuxent Parkway to Merriweather Post Pavilion, under the new name Free To Be Drive, along with a visitor drop-off area, a fourth park entrance, and the Tone Reeds, the fourth and final entrance sound sculpture. The timing of phase 2 and beyond will depend on available funding, and the actual order of phases 3 through 7 may not be the same as that listed above. All features listed above are discussed below, with the exception of Free To Be Drive and related vehicular roadways, parking spaces, and paths: much of that work has already been constructed by Howard Hughes Corporation under a later Site Development Plan (SDP-16-018) jointly submitted by Howard Hughes and the Inner Arbor Trust. (See also the last figure below.) Although paths, lighting, and elements of the Merriweather Horns will be constructed during their associated phases, for convenience they are discussed in separate sections. Planned pathways within Merriweather Park at Symphony Woods, showing the materials used for the various paths and roads. (Click for a higher-resolution version.) This diagram does not show the accessible path that runs to the south end of the Chrysalis. Images © 2014 Inner Arbor Trust; used with permission. 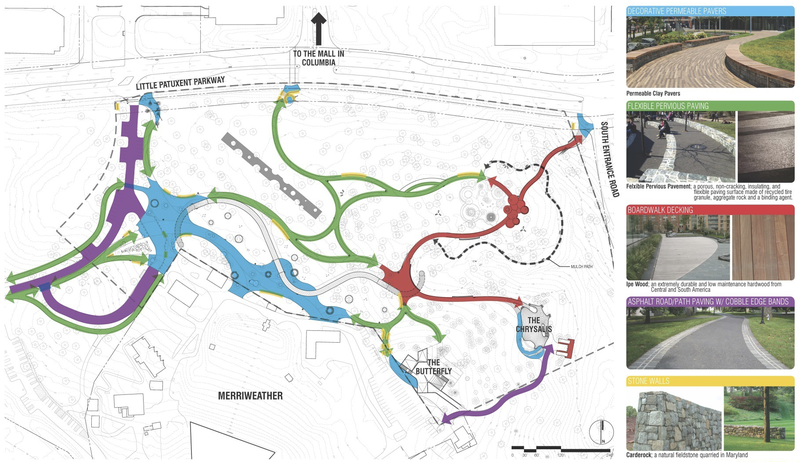 The plan for Merriweather Park at Symphony Woods includes over 2 miles of paths and walkable access roads and 4 separate pedestrian entrances into the park from Little Patuxent Parkway and Free To Be Drive, designed by landscape architects Mahan Rykiel Associates of Baltimore. These paths and access roads will not all be constructed at once, but instead will be built incrementally as part of the various phases. For example, phase 1 (the Chrysalis) included construction of a walkable access road to the Chrysalis from the Merriweather Post Pavilion VIP parking lot, and an accessible path to the Chrysalis from a newly-built parking lot with 7 handicap spaces. Additional paths will be constructed as part of the remaining phases, including adding two additional park entrances on Little Patuxent Parkway, one across from the access road to The Mall in Columbia, and one next to the existing access road from Little Patuxent Parkway to Merriweather Post Pavilion, and adding a fourth entrance from the future Free To Be Drive. Larger pedestrian areas, like the area in front of the Chrysalis alpha stage, will use permeable clay pavers (blue areas in the figure above). Regular paths, like that leading to the Chrysalis from the 7-space handicap access parking lot, will use flexible pervious pavement made from recycled tire granules, aggregate rock, and a binding agent (green arrows in the figure above). Boardwalks and decks, like the ramp leading to the Chrysalis stage, will be surfaced with ipe (“ee-pay”), an extremely durable and low-maintenance hardwood (red arrows in the figure above). Walkable access roads, like that leading to the Chrysalis from the Merriweather Post Pavilion VIP parking lot, will be surfaced with asphalt and edged with cobblestones (purple areas in the figure above). Any walls next to pathways (for example, as seen in the accessible path to the Chrysalis) will be constructed of stone from the region (yellow areas in the figure above). Finally, the pathway system will provide plenty of opportunities for people to sit and take a rest, using seating built into the stone walls, long benches next to paths, circular benches, and circular bench and table combinations. Like the boardwalks and decks, these will be built using ipe hardwood. Altogether there will be seating for over 2,000 people. Rendering of the Butterfly guest services building, as viewed from the Chrysalis looking southwest up the hill toward the Merriweather Post Pavilion VIP parking lot. (Click for a higher-resolution version.) Image © 2014 Inner Arbor Trust; used with permission. In designing the Butterfly nARCHITECTS aimed for immersion, lightness, and connection: to immerse visitors in the natural setting, impart a sense of lightness to the structure, and connect it to both the Chrysalis and Merriweather Post Pavilion. One key element in promoting these goals is the design for the roof of the Butterfly. The roof is designed for active use by visitors: to watch performances at the Chrysalis or those held on the roof itself, or just to hang out with friends at the rooftop bar. The roof will accomodate almost three hundred people, either standing or sitting on steps built into the upward curving wings of the roof. It will be reachable either by two exterior stairs or by an elevator within the Butterfly itself. The ground floor of the Butterfly has four wings, housing food preparation areas, a small art gallery, and restrooms. The central space will have seating to accomodate patrons of the café. The Butterfly also has a three-level terraced outside deck facing the Chrysalis, again with seating to accomodate visitors. The Butterfly can be entered from both the Merriweather Post Pavilion side (from the VIP parking lot) and the Chrysalis side (from the terraced deck), with glass walls providing a view through the building and a visual connection between the Merriweather Post Pavilion area and the woods leading to the Chrysalis—again promoting the goals of immersion, lightness, and connection. Rendering of the Merriground. (Click for a higher-resolution version.) Image © 2014 Inner Arbor Trust; used with permission. The Merriground, designed by Martha Schwartz Partners, is a children’s play area containing multiple elements: a double helix spiral slide, a climbing tower and slide, various elements that can be used either for seating (at their lower levels) or climbing, a ring of rope swings, a “spider web” of rope that can be used as a hammock in which to relax, and—last but not least—the Wondrous Tower, a 45-foot-tall anodized aluminum tower within which visitors can ascend a spiral staircase and look out over the park. The elements of the Merriground are custom-designed to have a common aesthetic and match the overall aesthetic of Merriweather Park at Symphony Woods: the elements incorporate circular and spiral shapes, and the wood used will be the same durable ipe hardwood used for the Merriweather Park boardwalk and decks. The Merriground will be located on the boardwalk (from phase 2) that leads into Merriweather Park at Symphony Woods from the corner of Little Patuxent Parkway and South Entrance Road. It abuts the Lily Pads, a set of circular decks with benches that forms part of that boardwalk. The Merriground thus not only serves as a play area, but also provides an attractive “entrance experience” for visitors arriving from the northeast, for example, walking from Lake Kittamaqundi on the multi-use pathway. Rendering of the Picnic Table. (Click for a higher-resolution version.) Image © 2014 Inner Arbor Trust; used with permission. The Picnic Table, also designed by Martha Schwartz Partners, has a very simple function: it takes an area of Merriweather Park at Symphony Woods that is low-lying and damp and turns it into an area that can be used for picnics, seating for events like Wine in the Woods, and just plain lounging around. As its name suggests, the Picnic Table can be seen as an alternative to and replacement for conventional picnic tables. However, it can accomodate many more people within its expanse of 300 by 25 feet: over three hundred people can sit on or near the edge for an event like Wine in the Woods. The Picnic Table also has a much lower profile than conventional picnic tables: it is only 18 inches high, and is designed so that it appears to float above the ground below: the edges of the Picnic Table are cantilevered over 6 feet out from the relatively small steel columns and girders holding it up. Finally, the Picnic Table is designed to fit into the landscape: it is covered with artificial turf to help it blend in to the underlying lawn, and has cutouts to avoid existing trees. (Seven new trees will also be planted to fill spaces within the existing tree cover.) The artificial turf and the underlying surface of the Picnic Table will also be perforated to allow water to drain naturally through the surface. The development phase that includes construction of the Picnic Table will also see construction of a third pedestrian entrance into the park from Little Patuxent Parkway, and the Land Horns sound sculpture near the entrance. This accessible entrance will be west of the two other entrances, near the existing access road to Merriweather Post Pavilion and the future Free To Be Drive. Oriented northwest to southeast, the Picnic Table itself runs roughly parallel to a section of this new path, and also roughly parallel to a separate path (on the other side of the Picnic Tables) constructed as part of the same phase as the Merriground. Visitors will thus have easy access to the Picnic Table from multiple segments of the park pathway system. Rendering of the eastern end of the Caterpillar, providing access to the Chrysalis. (Click for a higher-resolution version.) Image © 2015 Inner Arbor Trust; used with permission. The Caterpillar, designed by Martha Schwartz Partners, is the single most extensive feature proposed for Merriweather Park at Symphony Woods, about twice as long as the Picnic Table. It stretches over about a third of Merriweather Park from east to west, a circular tube covered with plants and other landscaping features. Although it’s designed to serve multiple functions, the Caterpillar’s primary purpose is very simple: to provide an attractive visual and physical barrier between the “performance park” envisioned in the Inner Arbor concept plan (Merriweather Post Pavilion, the Chrysalis, and associated venues) and the “public park” (just south of Little Patuxent Parkway). This is in support of the twin principles of “operational elasticity” and “the art of bounds” pursued by the Inner Arbor Trust: to allow both the park and the pavilion to expand as needed to accomodate particular uses, and to ensure that the park can remain open to visitors even when events are held at the pavilion. The striking design of the Caterpillar follows directly from these principles: a fence or wall would be too visually forbidding and unwelcoming for park visitors (as is the current fence around the Merriweather Post Pavilion property), while an earth berm of the needed height would be so wide that it would encroach upon the surrounding trees and suffocate their roots. Essentially a tubular green wall, the circular cross-section of the Caterpillar allows for it to be large enough to provide physical separation between the two park areas while having a relatively small footprint on the ground below. At almost 11 feet high the Caterpillar is high enough to discourage visitors from climbing over it, but its rounded shape creates a more organic and visually friendly impression than a vertical barrier. Gateways at either end (where the Caterpillar structure arches over the paths) will funnel pedestrian traffic between the northern part of Merriweather Park and the southern part. The Caterpillar does not follow the line of the existing fence on the property line between the Symphony Woods and Merriweather Post Pavilion properties. Instead it is located some distance north of the property line (towards Little Patuxent Parkway), with the area just south of the Caterpillar (towards Merriweather Post Pavilion) containing a pedestrian plaza and serving as an additional public area for visitors to the pavilion. In addition to acting as an attractive visual and physical barrier, the Caterpillar also helps with the prosaic problem of providing utilities for events such as Wine in the Woods that spread beyond Merriweather Post Pavilion or the Chrysalis. The structure is hollow, designed to contain electrical lines, water lines, computer network cables, and anything else needed to support events in Merriweather Park at Symphony Woods. The space immediately north and south of the Caterpillar can be used for event tents and other temporary structures, the fronts of which would face the paths and pedestrian plazas, and the backs of which would be next to any power or other utility outlets embedded in the Caterpillar. The Caterpillar can also support wireless access points to provide WiFi signals to a good portion of Merriweather Park at Symphony Woods. The Caterpillar will also support a number of other uses: At either end it will contain information booths for visitors to the park or the pavilion. Since the structure supports potted plants as the main visual element it can be used as a community garden to raise flowers or herbs, and since it’s intended to be lighted from within it can be used for visual art of various sorts. Martha Schwartz has proposed other possible uses as well, including having “portals” through which people could view artworks or educational displays, supporting “audioscapes” either natural (e.g., activated by the wind) or artificial (using microspeakers), or having the structure interact with visitors via smartphone or tablet apps. The Caterpillar can thus serve as a platform for a myriad of possible uses, and will be one of the unique attractions of Merriweather Park at Symphony Woods. Rendering of the Sky Horns at the northeast entrance to Merriweather Park at Symphony Woods (at the corner of Little Patuxent Parkway and the South Entrance Road). (Click for a higher-resolution version.) This rendering also shows a portion of the boardwalk by which visitors can reach the Merriground, the Chrysalis, and the rest of the park. Image © 2014 Inner Arbor Trust; used with permission. As visitors enter Merriweather Park at Symphony Woods the Inner Arbor Trust wanted to make them feel that they were entering a special place. In support of that goal the Trust turned to a local artist with a national reputation, former Howard County resident William Cochran. The result was the Merriweather Horns, a set of sculptures for the entrances to Merriweather Park, as well as other sculptural elements to be located elsewhere in the park. The Merriweather Horns are inspired by the ancient practice of producing sound via horns, from animal horns to musical instruments to the acoustic horns of old-time phonographs and audiophile speakers. As befits their inspiration, all of the pieces are designed to occasionally produce sounds of various types, soft enough to be heard only while standing near the sculptures, and muted during concerts held at Merriweather Post Pavilion or the Chrysalis. The Sky Horns will be located at the northeast entrance to Merriweather Park, at the intersection of Little Patuxent Parkway and South Entrance Road. They are a set of about a dozen long thin straight horns, from 6 to 23 feet in length, suspended among the trees and pointing down towards visitors entering the park on the boardwalk. (See the figure above.) Their sounds are designed to combine and evoke the human voice. The Song Cycles will be located at the central entrance to Merriweather Park, at the bottom of the stairs leading down from Little Patuxent Parkway. Resembling traditional phonograph horns, two of them (terminating in fan wheels) are interactive sculptures: visitors can sit at them and use a set of bicycle pedals to produce a series of sounds from the sculptures. Pedalling faster changes the character of the sounds, until eventually they reach a crescendo and the cycle begins anew. 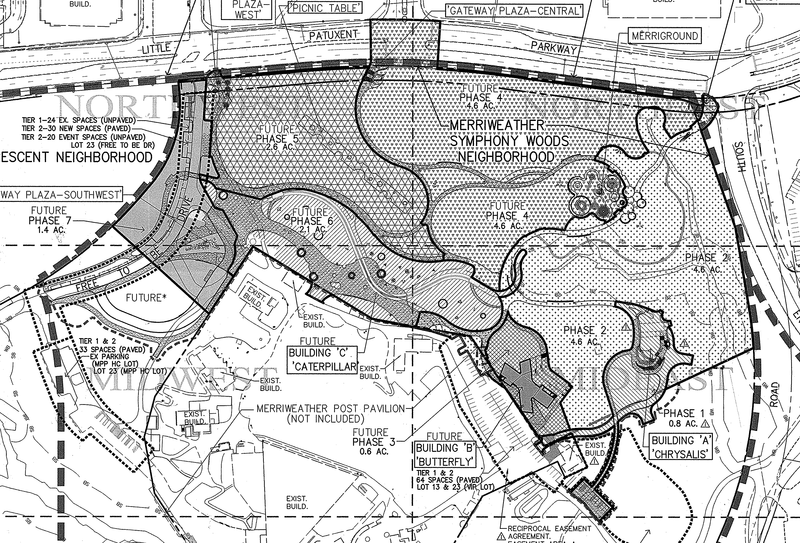 The Land Horns will be located at the northwest entrance to Merriweather Park, off Little Patuxent Parkway. They are a set of 6 large (up to 28 feet tall) horns, all but one with the bell part of the horn facing the ground. Five of the horns will produce a low frequency melody directed into underground acoustic chambers, with the other horn producing somewhat higher pitched sounds in harmony. The Tone Reeds will be located at the southwest entrance to Merriweather Park, off the access road to Merriweather Post Pavilion from Little Patuxent Parkway (the future Free To Be Drive). They are a set of over 200 thin vertical rods ranging in height from 12 to 18 feet, positioned in a loose cluster several feet off the path. They produce a light delicate chiming sound. In addition to the four main sculptures, there will also be about a dozen “pathfinder horns” at various points on the pathway system. These sculptures will serve as wayfinding devices, for example with two intertwined standing horns (from 8 to almost 10 feet tall) located at a fork in the path, each facing a different direction the visitor can take. The mouths of the horns will face down toward the visitor, with an interior gold finish covered by perforated stainless steel grilles with directional arrows and text. The pathfinder horns will produce soft sounds characteristic of the forest and its underground wildlife. They can also be synchronized together to play a soft “evening song” melody to mark the end of the day. Although they produce different sounds, all of the Merriweather Horns have a common visual aesthetic, combining white pearlescent fiberglass with stainless steel, designed to have a light appearance in a portion of the park that is in shade much of the time. 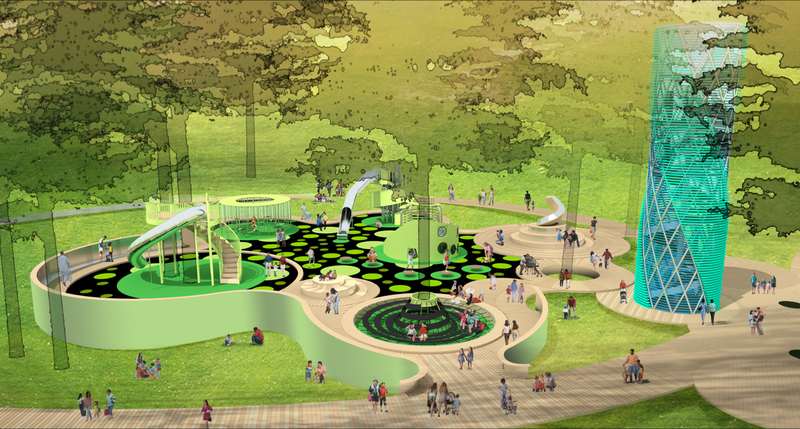 The Merriweather Horns will also be lighted from within in various ways as part of the overall lighting scheme for Merriweather Park at Symphony Woods (see below). The planting design for Merriweather Park at Symphony Woods. (Click for a higher-resolution version.) The lanscape in each numbered area will be restored with the appropriate plantings. Image © 2014 Inner Arbor Trust; used with permission. Although it’s sometimes referred to as a preserved forest, after years of use and relative neglect the Symphony Woods property is not close to being in a natural state: most of the property is simply a lawn with accompanying trees, and even the more wooded parts of the property lack the understory plants one would find in a truly natural forest. A key part of the plan for Merriweather Park at Symphony Woods is therefore to restore the woods to a more natural state while still making it possible for visitors to use the park on a day to day basis and during events like Wine in the Woods. The planting design was created by landscape architects Mahan Rykiel Associates, the firm that also designed the systems of paths in Merriweather Park, working with the Baltimore-based firm Biohabitats. Areas to be used by visitors, for example the hill next to the Chrysalis and the areas around the Picnic Table and Caterpillar, will be restored as natural lawns. Various areas in the more heavily forested eastern portion of the park will become enhanced woodlands, with native woodland plants (shrubs, perennials, groundcovers, and grasses) added to form a proper understory for the trees. A relatively open area in the north of the park and another to the southwest will be converted into native meadows. Finally, the streambeds in the eastern portion of the park will be restored and riparian buffers created between the streams and the rest of the park. Rendering of the lighting master plan for Merriweather Park at Symphony Woods. (Click for a higher-resolution version.) Image © 2014 Inner Arbor Trust; used with permission. The Chrysalis and Merriweather Post Pavilion will frequently host events in the evening. Visitors to Merriweather Park at Symphony Woods on those and other nights will want to be able to walk through the park and be able to find their way and have a sense of security. Proper lighting of the park is key to addressing these issues. The first layer is lighting for the pedestrian pathways of Merriwweather Park. This will be provided by small fixtures near ground level spaced every 5 feet, designed to shine light on the path without bleeding light upward. The second layer is lighting for vehicular roadways within Merriweather Park: access roads, parking lots, and visitor drop-off points. This will be provided by pole-mounted lights of various heights (each no higher than necessary given its location), facing downward to minimize light loss upwards. The third layer is landscape lighting in Merriweather Park areas where people would be most likely to gather: between the Butterfly and the Chrysalis, at the Merriground and Picnic Table, and between the Caterpillar and Merriweather Post Pavilion. Some of these lights will be low to the ground (similar to the pathway lights), while others will be suspended among the trees. The fourth layer is lighting for the Merriweather Horns, including both those at park entrances and the pathfinder horns located throughout the park. These will be softly lit from within. The final layer is “integrated feature animation”, that is, lighting of park features like the Merriground, Picnic Table, and Caterpillar that is designed to subtly change over time or in response to the actions of visitors. Illumination throughout Merriweather Park will vary by layer and feature, designed to meet recommended light levels for various uses and contexts while not producing excessive or misdirected light. 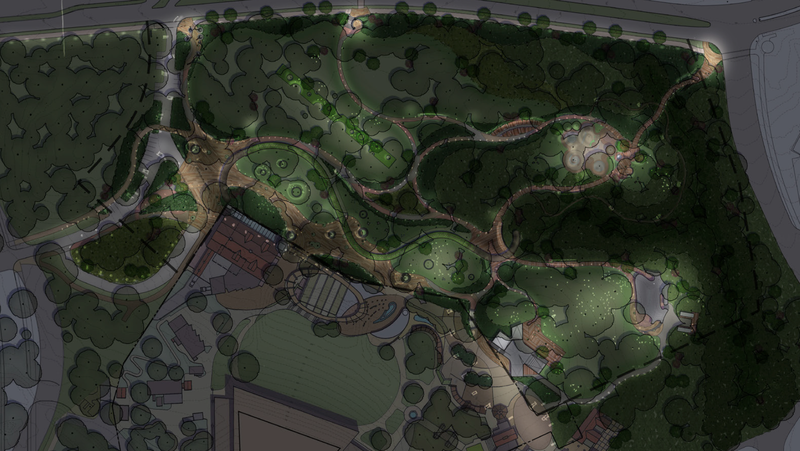 The overall effect of the lighting master plan will be to show all the features of Merriweather Park at Symphony Woods to their best advantages, making the park at night a magical experience for all its visitors. Panoramic view of the areas of Merriweather Park at Symphony Woods addressed by phase 7 of SDP-14-073 and by SDP-16-018. (Click for a higher-resolution version.) The view is south-southeast toward Merriweather Post Pavilion, with the future Free To Be Drive in the foreground extending from the extreme left to the stop sign at the intersection with the future Merriweather Drive, the lower end of the drop-off loop to Merriweather Park and the new pavilion box office in the center (behind the small piece of construction equipment), and the new parking lot with handicap spaces in the center right (behind the row of barrels). Image © 2017 Frank Hecker; available under the terms of the Creative Commons Attribution 4.0 International License. Martha Schwartz Partners/Practice/Profile. From the Martha Schwartz Partners web site. “Q&A with landscape architect Martha Schwartz”. A Newsweek interview from March 11, 2015. “13 mins interview with Mimi Hoang - nARCHITECTS”. An Arch20 interview from 2016 [?]. “Unabashed Designers of Delight” [121-minute video] (November 18, 2013). A presentation introducing the design team for the Inner Arbor plan. It includes a presentation by Martha Schwartz beginning at 12:00 and a presentation by Eric Bunge and Mimi Hoang beginning at 1:18:24. “Studio William Cochran/Bios”. Biographies of William Cochran and his wife and partner Teresa Cochran. “William Cochran: changing streetscapes through public art”, by Erik Anderson, May 18, 2016, Frederick News-Post. An article about Cochran’s work in Frederick and beyond. By design/Community presentation. 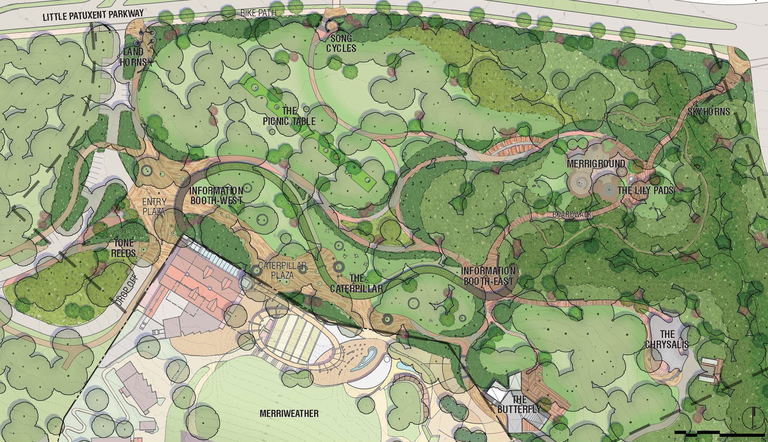 This page on the Merriweather Park web site features slides from the community presentation on December 2, 2013, including more renderings and design diagrams for the Caterpillar, Butterfly, and Picnic Table. By design/The plan. This page on the Merriweather Park web site features a gallery of renderings of the Merriground and the Merriweather Horns. SDP-14-073 (part 1, part 2, part 3, part 4, part 5). Although it can be difficult to read for the layperson, the approved Site Development Plan for Merriweather Park at Symphony Woods provides a wealth of detail about planned park features. SDP-16-018. A subsequent Site Development Plan (jointly submitted by the Inner Arbor Trust and the Howard Hughes Corporation) describing elements that are part of phase 7. The Inner Arbor pre-submission community presentation (December 2, 2013). Michael McCall presentation to the Howard County Design Advisory Panel [20-minute video] (February 26, 2014). Among other things, this presentation outlines the principles of “operational elasticity” and “the art of bounds”.